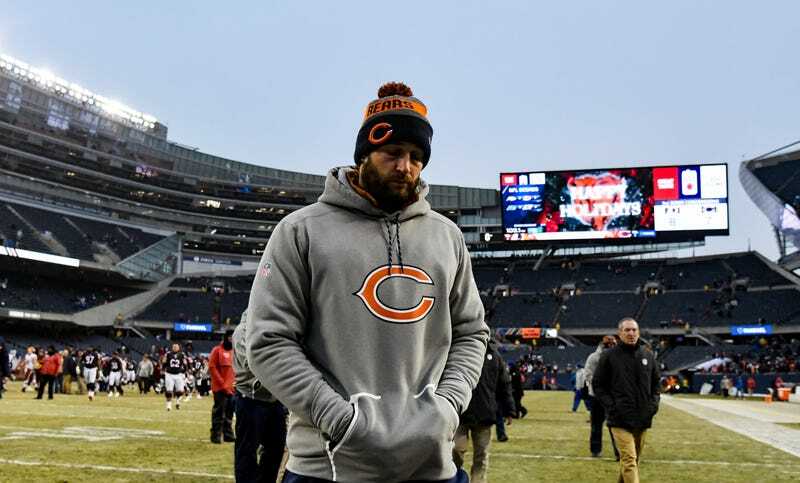 Here’s a sure thing: Jay Cutler is done with the Bears. Or, more accurately, the Bears are done with Jay Cutler—they reportedly told him in his January exit interview that they’ll be seeking other quarterbacks for 2017. One big question is whether the Bears can get anything for him. ESPN reported last night that Chicago has “actively started seeking a trade partner” for Cutler, who turns 34 in April and missed 11 games last season with thumb and shoulder injuries. For the Bears, this is just business: Cutler is making elite QB money while probably past his elite QB days, his health—he’s coming off surgery for a torn labrum in his throwing shoulder—is always a potential issue, and they’re finally ready for a real rebuild, starting at quarterback. The Bears would be thrilled to get something in return for Cutler, even if it’s along the lines of the seventh-round pick they got for Brandon Marshall, who they were similarly ready to move on from. But will they get anything once the league year opens on March 9 and trades are officially permitted? I’m skeptical. For one, it has the potential to be a buyer’s market for quarterbacks. Teams looking to sign a free agent QB will have their choice of the likes of Tyrod Taylor, Tony Romo, and Colin Kaepernick, and there are varying chances of Jimmy Garoppolo, Kirk Cousins, and Brock Osweiler being made available for the right price. Then there’s the draft, which doesn’t necessarily project as a special one for QBs, but isn’t barren either—any team looking for a signal caller should be able to find one in the first couple of rounds. Further limiting the pool of potential bidders is that Cutler functionally gets to choose. He does not have a no-trade clause, but he has something almost as good: a contract without a signing bonus and without any remaining guaranteed money. Cutler reportedly only wants to go to a contending team, and if he’s sent somewhere he doesn’t like, he could threaten to sit out, or to retire, or to refuse to rework his contract (he’s due $16 million this season.) A player has to return his signing bonus if he refuses to play, but since Cutler didn’t have one, he only has to play if he wants to. Of the teams in the market for a quarterback, and the fewer who won’t find one elsewhere, and the even fewer where Cutler would agree to be traded, I’m not sure any will pony up even a late pick for him, not when they know the Bears will just release him if there are no takers. The smart money says he’ll be cut soon after the league year starts. And then? Well, that’s the real question.